A kampong or kampung (both Malay and Indonesian spelling) is a village in Brunei, Indonesia, Malaysia and Singapore and a "port" in Cambodia. 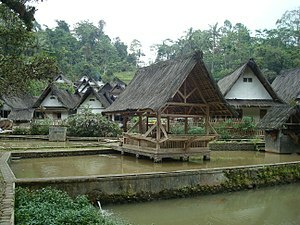 The term applies to traditional villages, especially of indigenous people, and has also been used to refer to urban slum areas and enclosed developments and neighbourhoods within towns and cities in Malaysia, Indonesia, Singapore, Cambodia, Sri Lanka and Christmas Island. The traditional kampong village designs and architecture have been targeted for reform by urbanists and modernists and have also been adapted by contemporary architects for various projects. Traditional kampongs are also a tourist attraction. A Malay village typically contains a masjid (mosque) or surau, paddy fields or orchards and Malay houses on stilts. Malay and Indonesian villagers practice the culture of helping one another as a community, which is better known as "joint bearing of burdens" (gotong royong). They are family-oriented (especially the concept of respecting one's family, particularly the parents and elders). It is common to see a cemetery near the mosque. In Sarawak and East Kalimantan, some villages are called long, primarily inhabited by the Orang Ulu. The native Malay kampung are found in Singapore, but there are few kampung villages remaining, mostly on islands surrounding Singapore, such as Pulau Ubin. In the past, there were many kampung villages in Singapore but development and urbanization have replaced them. Development plans for Kampong Glam have been controversial. Singapore is also home to Kampong Buangkok, featured in the film The Last Kampong. ^ "From 'Kampong' to 'Compound': Retracing the forgotten connections". singapurastories.com. ^ Azahari, Izah (21 October 2017). "Brunei will remain a MIB-guided nation, thanks to religious education". Borneo Bulletin. Retrieved 29 August 2018. ^ "Geoportal - Survey Department". Retrieved 2017-09-10. ^ "Brunei Postal Services - postcodes". post.gov.bn. Retrieved 2017-09-10.